Created in 2004, this site presents the DIABOLOGY DVD, directed by The Mad French Posse, french jugglers team who have a passion for the Art of Diabolo. In few years this DVD became very very popular and inspired the next generation of diabolists, to be now considered as the beginning of a new age of the Art of Diabolo. 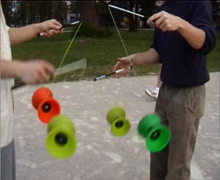 Since 2005, this site is also the main resources center on the web about the diabolo siteswaps, a mathematical theory describing how to juggle with 2, 3, 4 or more diabolos. This theory has been introduced in the world of diabolo in 2003 by 3 members of the Mad French Posse : JiBe, Baptiste and Priam. DSS Contest : The 1st Contest of Diabolo SiteSwaps will happen the 7th of July 2009 at the 32th EJC (European Juggling Convention) in Vitoria, SPAIN. The siteswap in diabolo, how it works ? [news 23 february 2005] Close release of DSSS. 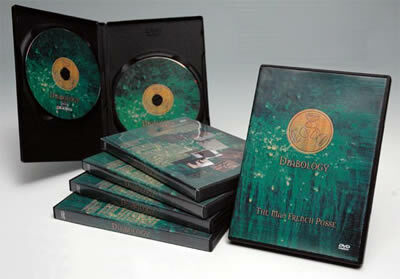 [news 13 december 2004] Release of DIABOLOGY !!! Trash, Priam and the Cie Filophile (Eric and Antonin) were in Ieper for the traditional "juggling day ". The act Trash with his diabolist baby. Watch the runs 3 and 4 diabolos in the videos section ! After long months of work on the creation of a duo act, Eric and Antonin present the show "Sur le Fil " and create the Compagnie Filophile. 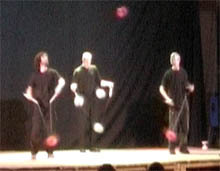 Priam is the only diabolist and the only french performer invited for the European Juggling Convention 2005, in Ptuj in Slovenia. One week of shows for more than 3000 jugglers and for the czech people, not used to see that !. Antonin, Trash and Priam were in Prague for the Czch Juggling Convention : Zonglovanni Festival. A special duo : Priam and Lena Koehn, the best women diabolist of the world. See the duo and the trio in the videos section ! DSSS is the first siteswap simulator for diabolo. It understands high and low notation, the suns with 1 diabolo, and can play until 9 diabolos. [news 23 february 2005] Coming out soon for DSSS. DSSS, the last production of Art Of Diabolo Society, is going to be a premiere in the art of diabolo. A group of diabolists and siteswapers is now testing DSSS. DSSS will be released in April 2005. More news in April ! The Mad French Posse is in Belgium, for the Juggling Convention of Ieper. Worshops program : fondamental elements and improvisation for 1 diabolo by Eric et Antonin, passing diabolo by Baptiste, JiBe and Priam, and 3 diabolos low by Baptiste et Trash. Saturday night, the show "Paris-Bordeaux-Toulouse" is the final of the Gala Show. 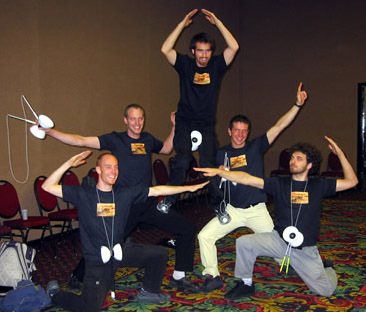 WJF 2004 : The diabolo contest was amazing, americans discovered what is diabolo today. The 3 judges were : Sean ANDERSON , Norbi WHITNEY and Trash. Let's mention that the Eric's worshop about fondamental elements and improvisation for 1 diabolo was a great success. 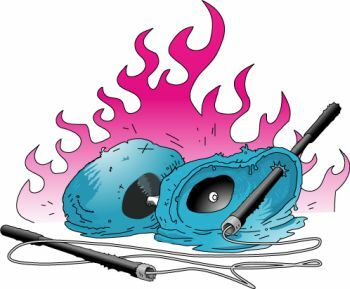 The diabolo contest will stand on sunday the 19th december 2004. Here is a present for Christmas ! You'll find in the section videos the clip "Of Baguettes and Diabolos" taken from the DVD. This is the original video, with the original musics. We didn't get the authorization to use some of them in the DVD, so you'll find in Diabology the same clip with different musics, especially made up for the video. We hope you'll like it ! [news 13 december 2004] Release of Diabology! That's it... After more than one year of work, the DVD is ready. Mister Babache will get 3000 DVDs on the 13th of december ! He will therefore be able to send them to shops on the 14th. If you can't wait, you can go to your usual juggling store and ask them to order some to Mister Babache. To finish with, the DVD will soon be sold on the web. Merry Christmas ! There is some new stuff in the resources category of the site. I've added a small tool for validating and visualising siteswaps, as well as some explanations on siteswap. These are so far the explanations that will be available on the leafleft of the DVD, but further updates will probably happen on the website. As for the DVD, we're in production now. Target date is still early December. FYI the DVD has been tested in order to be multizone. The DVD should be ready to ship by early December. Our royalties issue is still there, but we'll do whatever has to be done to overcome this. If we have to replace part of the music by some free music we'll do it. If this proves to diminish too much the quality of a video, we'll release it on the Internet. In short, we'll do what it takes, in the hope of encountering no other problem. Diabology won't be available for sale in Carvin, we're the first ones to be sorry about it.. However, the educative and freestyle parts will be shown at the M. Babache shop, which will allow you to see the main parts of the DVD, and wait until it is released at a later but unknown date. The DVD itself is finished since May, a few lucky people already saw it, and we're very proud of the result. The delay is because of pure legal reasons. We chose to partly use some known music for the freestyle parts, and to pay the royalties for these. However, neither M. Babache nor us are used to dealing with this, and we wrongly thought we only had to declare the use of these songs to the SUISA. We made a mistake there since authorizations from each producer are also needed, and we've had some unanswered requests as well as some negative ones. It's been a month and a half that we're struggling to get over this, sometimes redoing the editing to change the music. So the DVD is not ready, and we cannot tell when it will be ready. Let's finish on a higher note: this will be a double DVD. At the moment this site only features a presentation of the diabolo DVD Diabology. However, we have in mind to add other diabolo resources (some of them being already in development).